As the night draws in, what's happening on the City's streets? People are finally being released from the kettle at the Bank of England, one by one (and after a spell of being searched and photographed). Things took a nasty turn around 6.30pm, with missiles being thrown (we heard one girl, just released from the pen, complain about something metal that had come through the air). Police were running frantically around corners and the Guardian reports a baton charge. Let's not forget though, these people have been held there since lunchtime and frustration will be mounting. We're shocked to hear of police closing in the Climate Camp - and Indymedia is talking about a baton charge there too. A ramble through the Camp around 6.15pm this evening was as pleasant a stroll as we've ever taken in London. 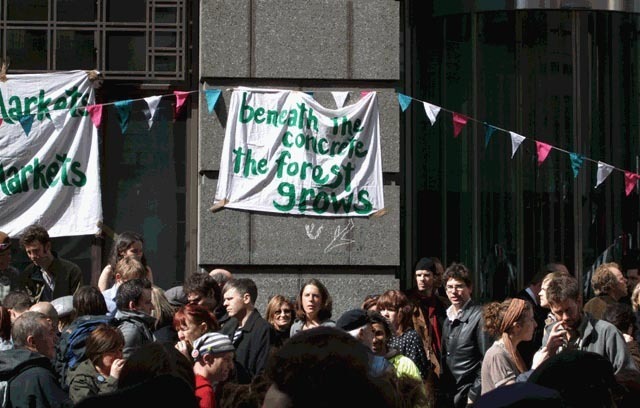 Protesters have erected tents in the road between Wormwood Street and Threadneedle Street, were cooking food and generally chilling out - it reminded us of a miniature urban Glastonbury. We were slightly perturbed by the sight of police with helmets and shields but didn't think for a moment they'd go in. The BBC reports that from 4.30pm "a different sort of demonstrator has started to arrive - clad in black, masked and aggressive" but we saw no such people, or felt any dodgy atmosphere, and the Guardian's Paul Lewis tweets that a colleague saw no provocation. The police claim demonstrators are setting things on fire, but we can't help but wonder if they've mistaken camp or cooking fires for wanton destruction. This is a campsite, after all. It smacks a bit of the Met wanting to break up the camp so they can all go home. News from the Alternative Summit is that it's taking place, which is a big success in itself. BP sensibly postponed its party in the British Museum, particularly on a day when they announced they're cutting 620 jobs from their solar business, so the planned protest there has also been cancelled. Let us know your stories from today, and post your photos in the Flickrpool.